Richard Conte plays the obligatory Man With a Past in RKO's Bengazi. Joining up with disreputable Irishman Victor McLaglen and army deserter Richard Erdman, Conte heads into the African desert in search of hidden Arab gold. They in turn are pursued by British police inspector Richard Carlson and by McLaglen's daughter Mala Powers. When the raffish trio find the gold, they must defend themselves against hostile Arab tribesmen. The remainder of the film evolves into a reworking of the 1934 RKO film The Lost Patrol, which also costarred Victor McLaglen. 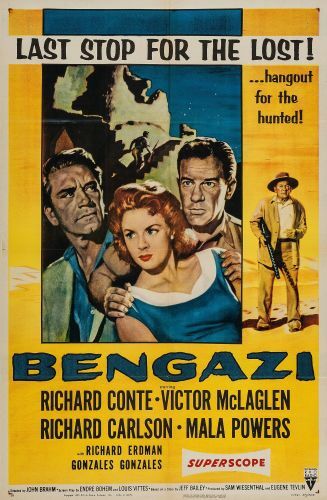 Bengazi was filmed almost entirely out-of-doors, on location in Arizona's Yuma Desert.